Is death the end? Or, to put it another way, do we survive bodily death? Some shrug their shoulders and declare we simply can’t know. Others just say no. And a few, flying their philosophical colors, pretentiously profess to not even understand the question. Curiously, the overwhelming majority of human beings throughout the course of history have taken it for granted that death is not the end, that there is a life after death. This striking and seemingly instinctive belief has been embodied in the religious traditions and philosophical reflections of most cultures. There Is Life After Death is the first of its kind in that it assembles and analyzes a comprehensive range of data on life after death and then provides the framework needed to understand the data. No previous book has presented such concrete evidence—evidence based on the accounts of eyewitnesses as well as on data derived from diverse sources through out the world and history—supporting the existence of an afterlife. Above all, the book provides exciting and compelling answers to the urgent question: What lies on the other side? Roy Abraham Varghese has worked on the interface between science and religion for over two decades. His book Cosmos, Bios, Theos had contributions from 24 Nobel Prize-winning scientists and was described in Time Magazine as “the year’s most intriguing book about God.” Another of his books, Cosmic Beginnings and Human Ends, won a Templeton Book Prize. Most recently, Varghese coauthored There is a God: How the World’s Most Notorious Atheist Changed His Mind. He was a panelist at the science and religion forum in the Parliament of World Religions held in Chicago in 1993, and an invitee and participant in the Millennium World Peace Summit of religious and spiritual leaders held at the United Nations in 2000. He lives in Dallas, Texas. 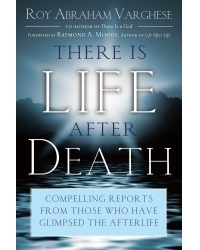 Dr. Raymond A. Moody, who wrote both the Foreword and a section of the book, needs no introduction to aficionados of the afterlife. His pioneering work, Life After Life, which sold 13 million copies, introduced the idea of near-death experiences to the world.